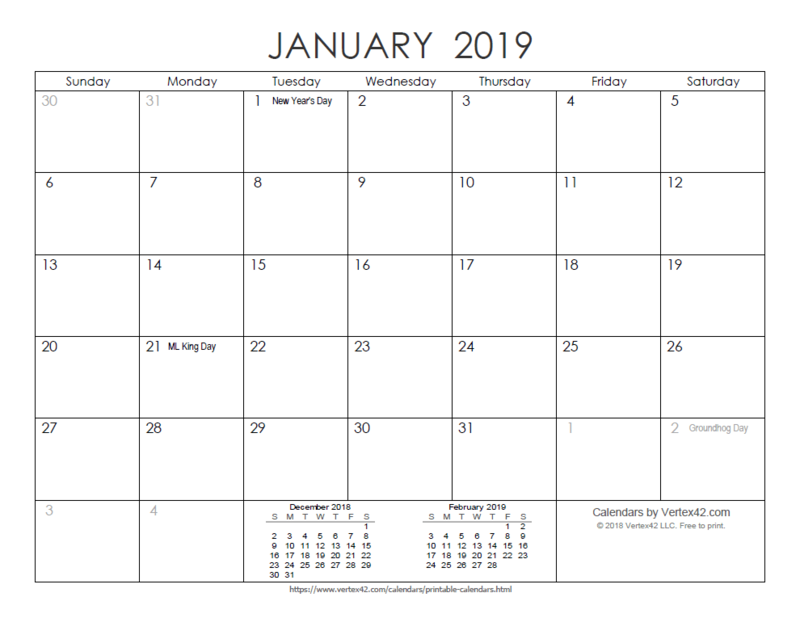 Download a free printable calendar for 2019 or 2020, in a variety of different formats and colors. 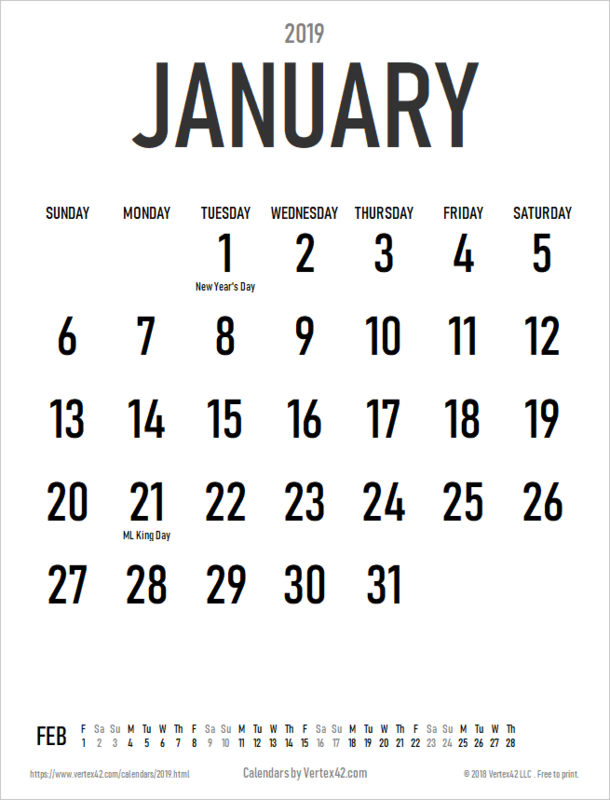 These free printable calendars are available as PDF files that you can print on your home, school, or office computer. 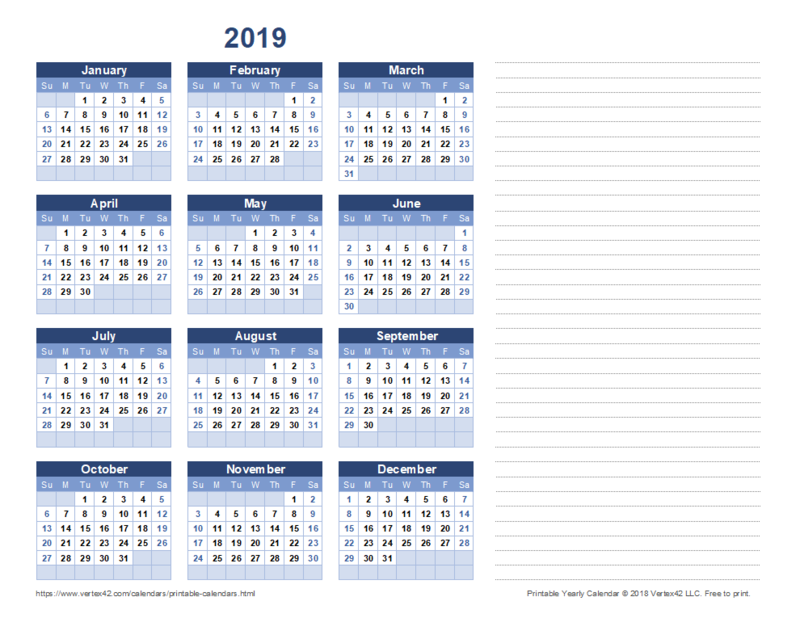 If you'd like a calendar that you can edit and customize, browse Vertex42 to find a 2019 or 2020 calendar template for Excel! 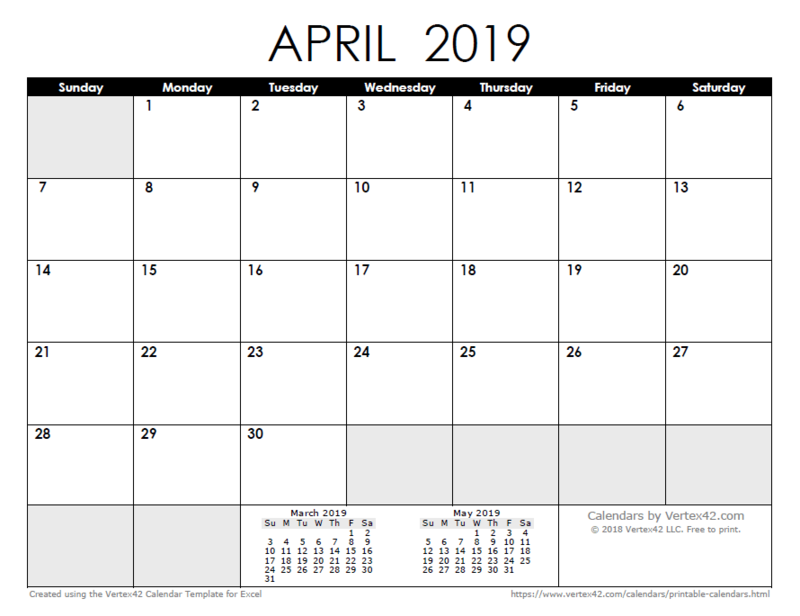 Try the original monthly calendar template, one of the printable yearly calendar templates, or the new perpetual calendar template. 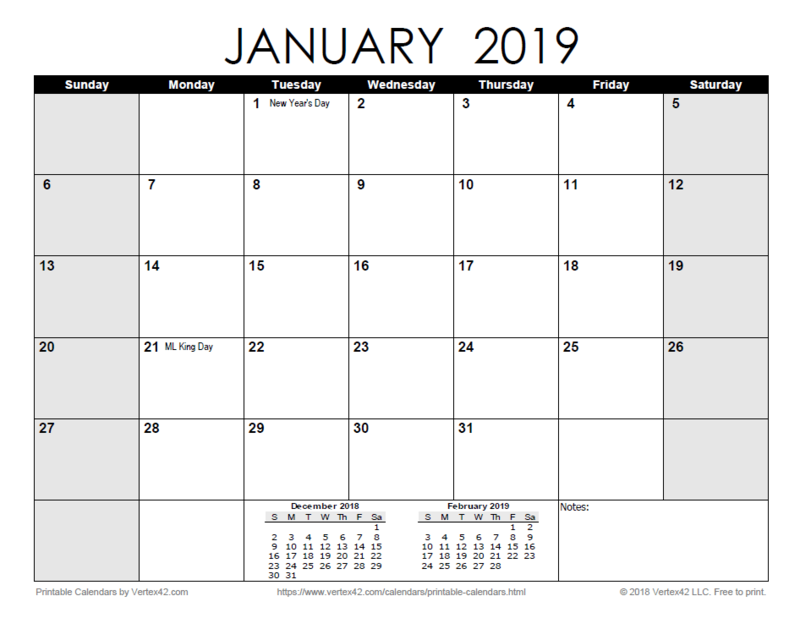 The following free printable calendars may be used and printed at no charge (any number of paper copies), provided that the links and the copyright notices are not removed. Please share these calendars with your friends by linking to this page or using the +1 or Facebook like buttons. Unless otherwise stated, all of the files below are 12-month calendars with one month per page. 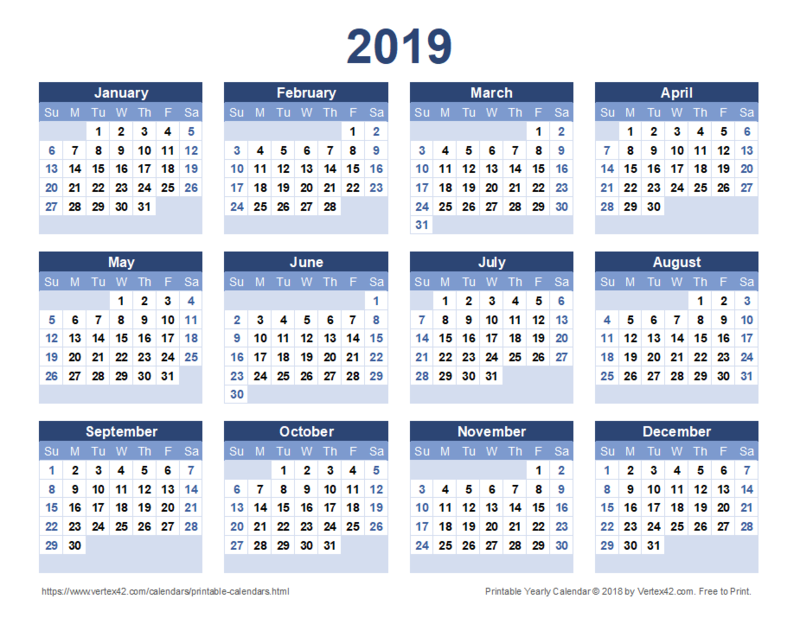 For a printable 2019 calendar or 2020 calendar, click on the year following the particular type. 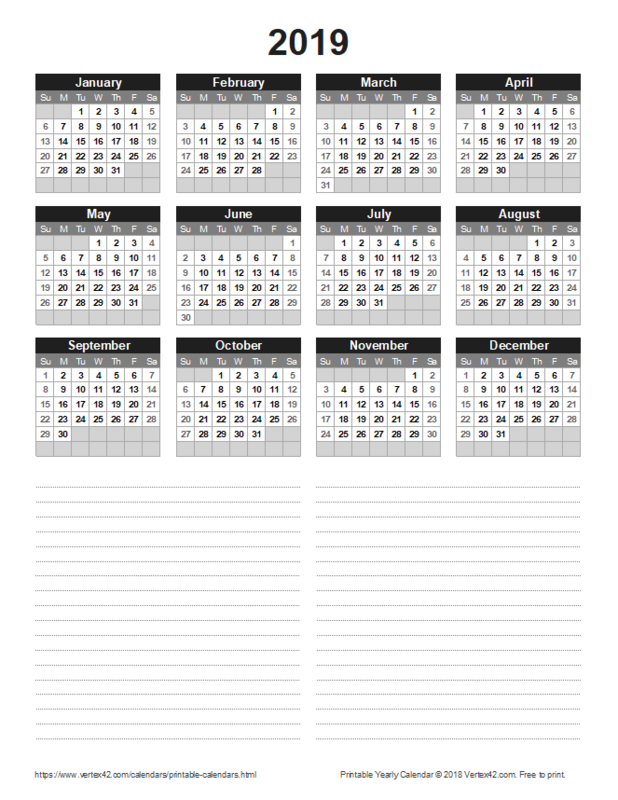 The "blank" calendars are simply calendars without holidays. Prefer a bit of color? Try one of the more colorful options below. These all include U.S. Holidays. 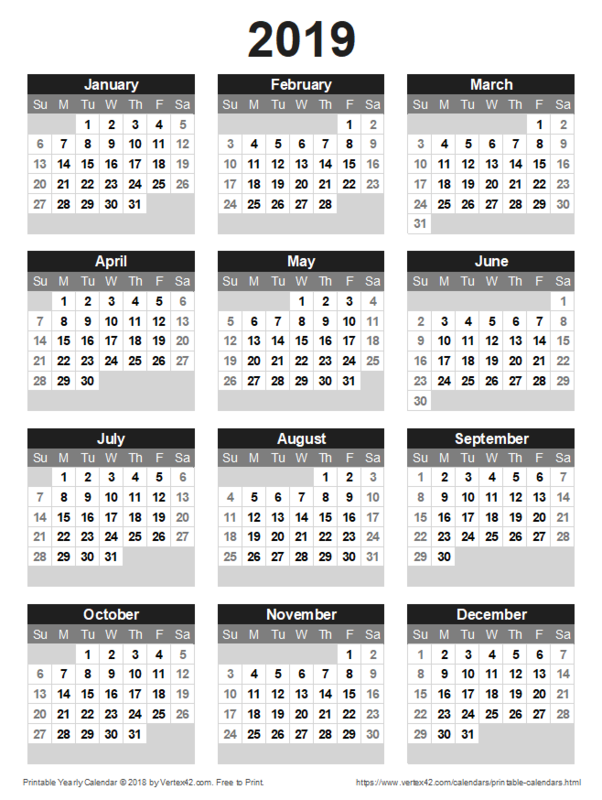 If you'd like to customize both the color and remove or change the holidays, try our Monthly Calendar for Excel. This design is great for displaying on a wall, with large numbers that can be seen at a distance. 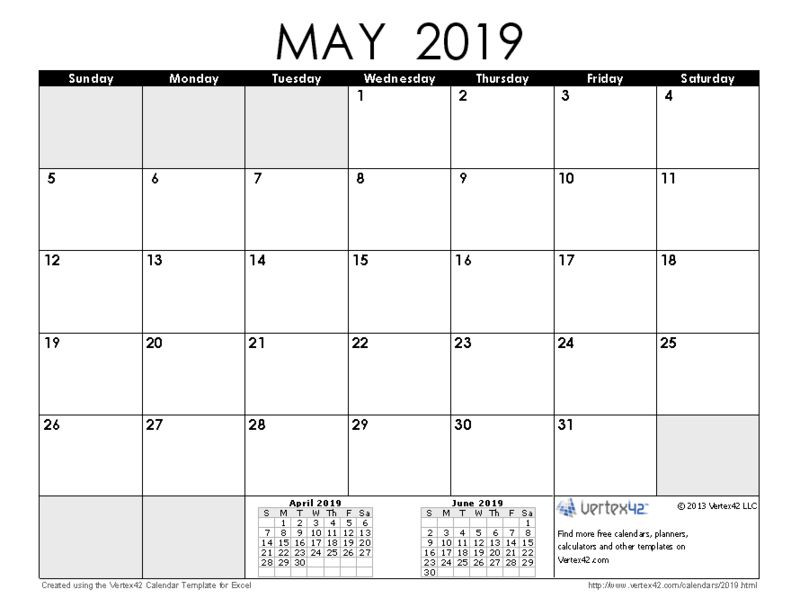 The horizontal next-month calendar, designed by Jim Wittwer, may appeal to those looking for something new. Create your own daily planner by printing planner pages for a 3-ring binder. Less detail than the daily planner, but saves on paper. 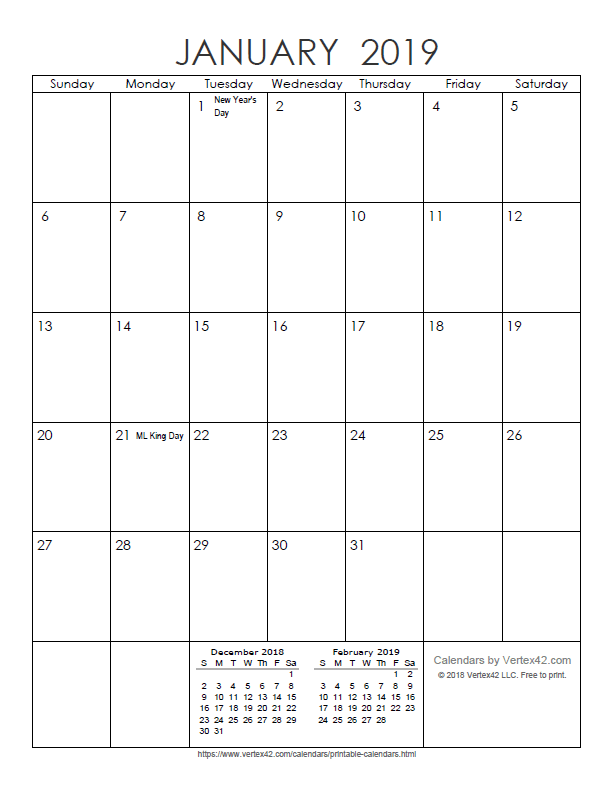 Free Printable Academic-Year Calendars: July through August of the following year, multiple colors. 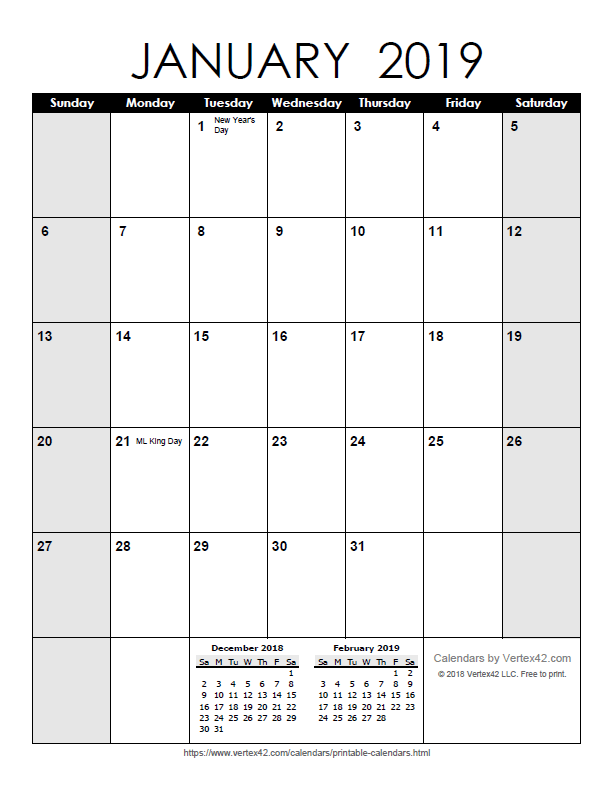 Free Printable Monthly Calendars - This site has many calendars that can be printed for free. Some are in PDF format, and others are html. 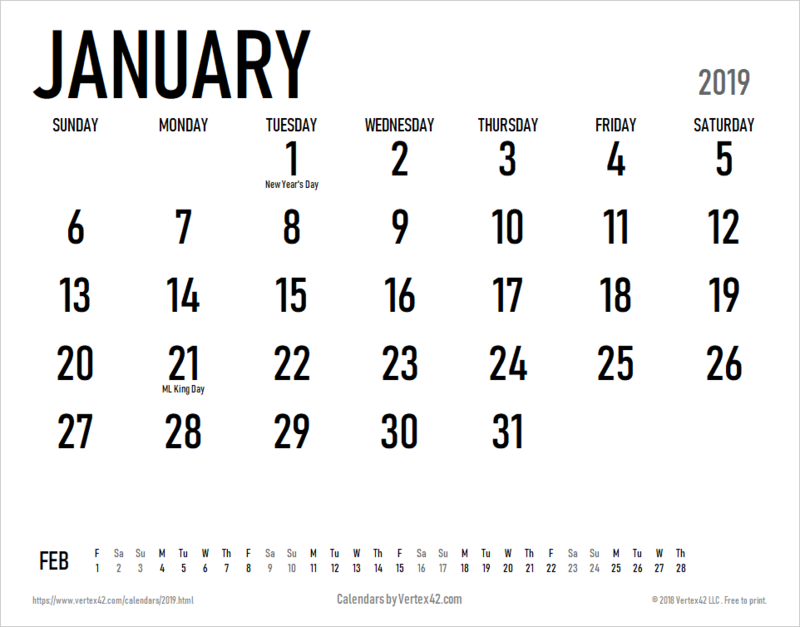 Free Calendars with Images - Creates HTML calendars with many images to choose from (cartoons, animals, etc.) in multiple languages.